It's a been a while so I thought I would re-watch this series to see if it was as good as I remember. Turns out it was even better. This is one of those shows that has so many subtle hints and foreshadowing that it's impossible to catch them all on the first viewing. On top of that, the plot is much much deeper (pun very intended) than it seems on the surface. You will find out what it means to love and be loved. That is this anime's main theme. People who rated this show low didn't fully understand it. Because if you did fully understand it, you might have seen the same absolute masterpiece of storytelling and philosophical commentary that was not only so gorgeously animated that it was often breath-taking, it had a perfectly formulated, smartly and elegantly written script that actually made sense all the way till the end, if you were paying attention. Every emotional scene was made so because of perfect build-up and real emotional attachment to fictional characters that can only be achieved through good writing. And don't even get me started on the character development in this show. Any show that can turn the most hated character into the most liked character within the course of a few episodes is doing something right. There are no stock-characters here, I can assure you. Each and every one of the main cast (and many of the side characters) go through a real, visible change that makes them into a better person who can move forward in their lives. And the soundtrack! Oh god, the soundtrack is to die for. Absolutely the best soundtrack I've heard in, well, just about anything. They fill almost every moment with beautifully orchestrated music that perfectly fits the mood of the situation. So much so, that this anime does the opposite of most other shows and actually uses silence to get a change of mood across instead of music. Suddenly you are under the sea, in a silent, dark city, hearing only the sounds of the waves or the echoes of the deep, staring out into the emptiness along with the characters and you feel a lull come over you as you just sit entranced by how convincing this show's setting is; and you want to be there too, underwater, breathing and walking like nothing is strange about it. And then in the next moment there's the sound of violins and a choir and drums and you're pulled into the desperation of this next scene and you cry along with the characters and you laugh along with the characters. And it all feels very natural because thats what a good soundtrack does. And then you start to hear the end-theme play during an intense scene and you think "No! Not here! Don't end the episode like this!" And so you play the next one. And thats how you end up binging through all 26 episodes in 2 days. Now apply all that attention to detail I just rambled on about to the animation and then triple it and you might scratch the surface of how beautiful this show is. PA Works is known for having great animation but this show is far beyond Angel Beats or the utter travesty of fiction that is Glasslip. This anime is up there with 5 Centimeters Per Second and Spirited Away in the animation department. Every scene could be a desktop background, and more than once I was tempted to take a screenshot to do so. If you want a lot of action and comedy, you should probably look elsewhere. But if you want a work of art that might actually change your perspective on life a little bit, and if you want emotion and fulfillment, look here. 5/5 stars + 2 bonus stars for being extra amazing. A bit of a dull lull for me. Like with Angel Beats! and Anohana, I was in the mood for another one of those shows that really tugs at the viewer's heartstrings. Going down the list of possibilities, the name "Nagi-Asu: A Lull in the Sea" peaked my interest, though I wish it hadn't. Nagi no Asukara is about a group of middle schoolers who all love each other, but each one loves a person who isn't in love with them, and all of them conveniently refuse to confess just long enough to stetch this out into twenty-six episodes. Midway into it, I thought Nagi-Asu was evolving into a more engaging storyline. What began as a tale of puppy love amongst 14-year-olds was gradually becoming a more complex story showcasing aspects of racism followed up with a more pressing matter pertaining to the survival of both groups. Well, let's just sweep all of that under the metaphorical rug, because we need to get back to this silly love pentagon, which has now grown into an absurd love heptagon, and waste time watching these kids cry constantly in the process. It's difficult to sympathize when the characters respond to everything in an overly dramatic fashion, especially when most of their problems could have been solved immediately if they would have just communicated a bit. After a while, I just sat here going, "Oh look, more tears. Maybe you should run away before he asks something that might straighten things out." And that's the key issue I have with Nagi-Asu. In order to maintain that confusion and keep the audience guessing, the influence of the creator is blatantly seen throughout the show. Every decision these kids make up until the end is the worst one to choose, and if that's not enough, an outside force will occasionally step in to interrupt the moment. Look, delaying plot devices should not be used in bulk. People eventually get sick of seeing them, and, as a result, the story no longer felt authentic. The only reason I continued to watch this mess was because I just wanted to finish what I had started. Ultimately, I won't say this is terrible and you should avoid it. When viewed by the target audience, Nagi-Asu provides a magnificient display of over-the-top teenage drama. I'm just not a teenager anymore, and I'm sure that has a lot to do with why this failed to provide me with the emotional response I was really hoping to experience (maybe I should have watched Clannad, instead... guess I still could). Actually, the lazy explanation near the end deserves some of the blame, as well, because, once again, omnia vincit amor... yay. My rating is going to be three stars, because I'll admit this is a little better than average (everything looked pretty <3), but, as I mentioned before, if you're part of the target audience, then feel free to think of this as a four star series. Oh lawd Jesus. This is amazing! I don't usually write reviews but this time I had to. The animation,story, characters are a 5/5. The newest episode just gave me chills. I usually don't watch romance anime but this anime is so much more. The characters feelings and everyday life is very relateable to anyone who has had a crush, loves one pass ect. Highly recommened ! When I first started watching this show, I thought well this will be a good time killer. I love crunchyroll because it allows me to sample all different kinds of anime, everything from silly borderline sis-con eroge to action oriented shonen. Because of this, ill watch the first episode of almost any anime that appears on this website. Some times the anime turn out of be stuff I can't get behind and some times i'm rewarded. Nagi no Asukara is the latter but its a bit more complex than that. The first half of Nagi places out heavy on the romantic entangling between the characters and "coming of age" style of slice of life. On the surface and at the outset you could very easily assume this is a very shallow anime and if you aren't fortunate enough to watch far enough into the series you would be right in assuming as much. Slowly, as the series continues, different nuances become more and more apparent. The characters start off very stereotypical with each fitting into different archetypes. Slowly these archetypes are augmented and the subtlety of each character surfaces in more profound detail allowing the story to flow very nicely yet at a very slow pace. The animation is very moe style but in the latter half of the story it really serves to accentuate things, complementing them and creating a world that you would really want to visit your self. This depth took be by surprise in a great manner. Some of the scenes are just so beautifully haunting that you cant help but appreciate all of the hard work the artists put into them. The very slow moving plot seems rather simple at first but as it progresses it moves in less and less predictable territory. What makes this all the more exciting is that there is a lot of foreshadowing scattered through out scenes from the first half and yet you cant truly appreciate this until you get deeper into the anime. As I write this, the anime is close to the final stretch but there are still some very complex questions that have yet to be answered. The metaphor is very very heavy in this show from the way the plot flows (like waves) to the character design. I will leave this review unfinished and with 4 stars until I see the final episode. I don't wish to expose spoilers nor do I want to jump the gun. I will say however, that everyone who likes anime should take a look at this one. Everything about this anime is extremely well done from the lay out of the plot, the sound assets, the voice acting, the character design and general art/animation. What first drew me into Nagi no Asukara was the artwork for Shishiso (probably spelled wrong), the underwater town where our main characters are from. What kept me was the creativity in creating the characters and the writing. Nagi no is a well rounded and delightful fantasy that I hated to see end. A truly GREAT anime that all should enjoy. Now, I will be honest first and say that at the very beginning I was skeptical of this anime. P.A. Works, haven't seen alot of their stuff. They have on their rap sheet....um...Well they have Angel Beats, Red Data Girl...ooh 'Another'....True Tears... Canaan... hm. Well, I can say this now. Nagi no Asukara is easily the best series I have ever seen from them. 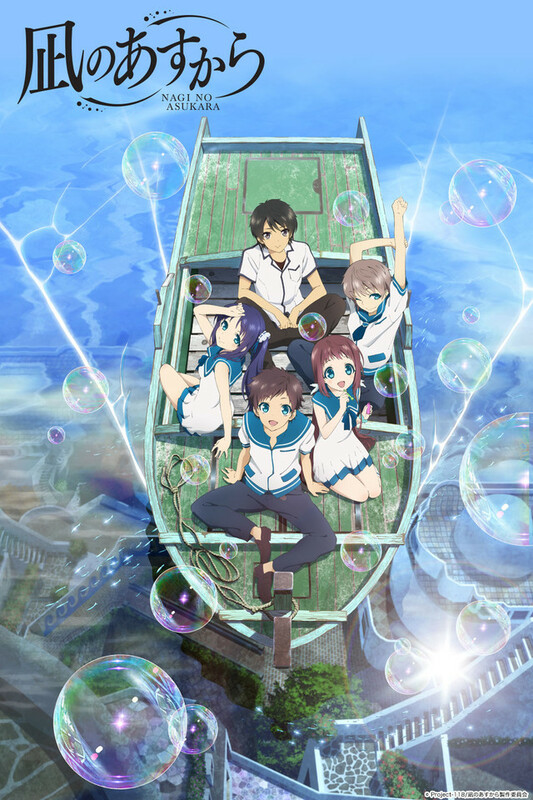 Following the life of 4 middle school kids after the closing of their local middle school under the sea, Hikari, Manaka, Chisaki, and Kaname transfer to the local middle school on the surface. Holding some grudges against the surface, and justifiably so, they begin the job of trying to fit in with their new surrounding. They are soon joined by the strong character Tsumugu who lives on the surface and becomes the closest surface friend to our 4 from the sea. That synopsis is ONLY for the first half. I say this because Nagi no Asukara uses one of the best time skips I have ever seen in all my time of watching anime. I truly mean that. Many anime just use it as a way to bridge a gap in time but not Nagi no Asukara. The time skip in this series is the biggest plot point in the entire series that all the characters are latched onto; And due to its use and setup with respect to the story it throws one of the biggest twists (in a good way) for the entire series. And THAT is what makes Nagi no Asukara so good. It's how the series is told that makes it all feel complete. Characters change as the story progresses and I am including before and after the time skip. Though, they all do keep their core character traits that stay with them in both halves; most notably in Tsumugu. No one character is pandering and if you overlook Chisaki in the 2nd half there is little fanservice. The series composition was written by Mari Okada, who's other notable works include the series composition for Toradora! and Anohana, and her way of storytelling in Nagi no Asukara definitely reflects that of Anohana just by way of the supernatural elements that play key roles and how the characters create a web of romance normally found in shoujo anime/manga in a more shounen type of storytelling. It makes the entire series feel suspenseful and complete and the happy faces of youth are quickly swapped with a true feeling of sadness, loss, and regret for these characters that is hard to find in anime regardless of genre, studio, or length. I do have to unfortunately say that the first half of the series is slow and that it will take some time for the series to show its true colors but if you can watch through it all, you will love the series. In all honesty....Nagi no Asukara is the best romance anime I have ever seen. There is nothing I have seen in my time of watching anime that can compare to the amount of thought put into the setup, execution, and pure storytelling of this series; with the closest being Puella Magi Madoka Magica. Everything in this series flows into a true gem of the romance shounen genre and I can safely give Nagi no Asukara a 5 out of 5 and a full recommendation for it. What an amazing anime. The animation is incredibly beautiful. I appreciated the details used on the surface to show off the rust on most of the vehicles and structures from the salt spray. The soundtrack fits perfectly. I loved the sound effects used while in the sea. It really reminded me of being in the ocean. The characters grow on you as the story progresses. I really felt for all the characters as they struggled to come to terms with their feelings and emotions. Definitely recommend this anime. When I first saw this I thought it was going to be rather dull, but boy was I wrong. The first episode was a little slow, but appropriate for the development. I thought the characters were a little too at ease with no real goal, besides their problem with people from the surface. The story of Nagi no Asukara is basically this conflict between the people of the sea and the people of the surface. The two constantly argue over everything with huge distrust towards people of the other side. Our protagonist Hikari struggles as he finds himself in the middle of this argument. This conflict later bears pains that create problems for both sides and Hikari with his friends must find a way out of it. The action of this show was fairly slow. The only real form of action in the show is through drama between characters. But about midway through the anime something happens that adds so much action that it really makes up for the lack of action in the beginning. I thought that the action in the end was again a bit slow with the wrapping up of the story, but nonetheless the action was enough for me to watch till the very end. The pacing of the show was quite nice. Though there were parts I thought were slow, I enjoyed it. The slow pacing really was intended for a show like this, it gave enough screen time for characters and really made for some nice lead-ups. The slow pacing added this extra suspense to when there was a huge plot twist and really complimented the action/drama of the show. The characters were well developed. The main character Hikari had a deep personality and a strong thought that really went well with the anime. The main supporting characters were well thought out and were interesting to watch because each character has such a different view point on things that it really adds to the story. Manaka and Kaname were one of the most developed and had very different personalities. Kaname was always subtle and quiet. Manaka was always kind and had this cute appeal to her. Tsugumu was a bit of a smart-alec and didn't talk much throughout the series until the end. Chisaki was just a supporting character that united the group. The animations were excellent in this. I thought the scenic backgrounds and artworks were the highlights of the show. It had this special kind of abstract style to the artworks. They were just beautiful. The animations with the artworks were nice, they had smooth transitions and had some nice angle vantage points in which changed the perspective of the scenery. This show was visually stunning and had a nice plot with solid characters. In short I thought this was a pleasant show that carried it's uniqueness through it's artworks and character relations. The only thing that I had a problem with was Chisaki ending up with Tsumugu, but that's my opinion. Aside from that I thought it was enjoyable and is something that should be watched. Nagi No Asakura tells the story of an alternate Earth... one in which humanity originated from the Oceans, possessing an outer layer of skin known as 'Ena' that enables them to function underwater. Some time long before our story takes place, humans who longed for the surface shed this layer and began life on land, still paying homage to the Sea God. As our story begins, those still living underwater and those who live on land have begun to become somewhat estranged, and many of those on land no longer revere the Sea God. As we enter, our four main characters have had their school closed and are forced to attend school on the surface despite living in the sea. This event is, of course, the catalyst behind the entire story. Nagi No Asakura is an interesting show... on the surface it's an incredibly overdramatic - even for an anime - tale of children attending school and trying to restore an old tradition... but there's a lot more to it than that. Going beneath the surface reveals a show that almost has too many things going on at once. The show uses this strange analog to our Earth as the medium through which it tells its stories. These stories hit a pretty wide range of subjects including a simple yet touching tale of a young girl and the woman who wishes to become her new mother; a rather strange and awkward coming of age story; several intertwined and unfortunate love triangles ( love dodecahedron? ); even an attempt at delivering commentary on discrimination and how it can be overcome. Since there are so many disparate stories, unfortunately they don't mesh together all that well. And, because there simply are so many I'm sad to say few of them are particularly impactful or moving. There are four main characters, with a fifth being arguably just as pivotal to everything, through which these stories are primarily told. While the characters themselves are interesting, and adorable, they really aren't terribly involved in the really effective moments of the show. The points where the show really manages to succeed are when the side-stories get enough focus to tell a dedicated story. Unfortunately, this happens rarely throughout the first core arc that I've watched thus far. Most of the time the show is struggling to juggle a dozen arcs at once and provide equal air time to all of them... and many episodes just end up losing their focus. And the ones that don't lose their focus seem to be the ones that put our main characters in a supporting role, which is unfortunate because I find the characters quite fascinating. One final thing that I found rather shocking, as awkward as it is to say so, is that despite the show featuring several characters who perpetually wear typical Japanese school uniforms - I cannot think of a single moment that felt like it was trying to sexualize them or simply provide fanservice. Yes the girls are attractive and utterly adorable... but the show is content to leave it at that. That is something that is all too rare among anime nowadays. Don't get me wrong, I don't have a problem with fanservice or sexualisation of female characters, but it's great to see a show that is confident enough in its content to not feel the need to go there.